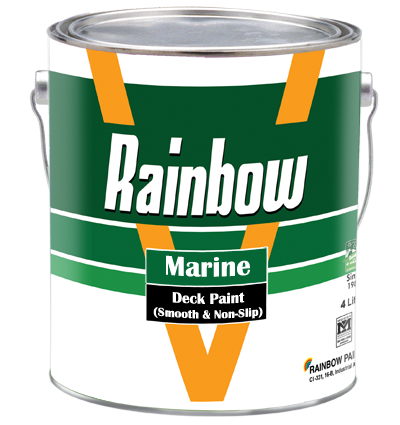 Rainbow Deck Paint is developed for all type of decks with high water and scratch resistance. Remove all dust, dirt, greasy & flaking paints. Apply 2 coats of Rainbow Marine Under Coat on exposed surface followed by 2 coats of Rainbow Marine Enamel. : 2) Recoatable 16 Hours Shelf Life: 12 Months if kept in sealed container under normal room temperature. Application: Brush, Roller, Spray Packing: 0.91, 3.64 and 14.56 Ltrs.